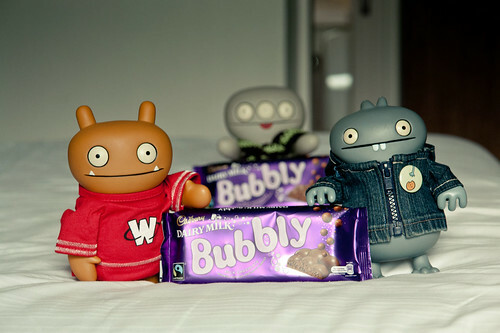 Uglyworld #1558 - Sneaky Bubblyers (Project TW - Image 149-366), a photo by www.bazpics.com on Flickr. As tonights is our lasts nighter on the islanders of Greaters Britains, we decidereds to leavers that youngers buck Cinko outs as he has been showerings us ups at everys cornerer of our holimaday. Tonights is choco nighters for us, so we scoreds us a biggerers bar of this tastiers new offerings from Cadburys where they has injectereds Dairy Milk with millioners of bubblyers. They is supposereds to tasters so amazerings, so I'm sure you can undermastanders why we can't lets Cinko has a bars of it toos!